Father, you made Peter Chrysologus an outstanding preacher of your Incarnate Word. May the prayers of St. Peter help us to cherish the mystery of our salvation and make its meaning clear in our love for others. Grant this through our Lord Jesus Christ, your Son, who lives and reigns with you and the Holy Spirit, one God, forever and ever. Amen. According to the 1962 Missal of Bl. John XXIII the Extraordinary Form of the Roman Rite, today is the feast of Sts. Abdon and Sennen: two eastern martyrs, probably Persians. Their cult at the Pontian cemetery seems to show that they met their death in Rome. In the ninth century their bodies were translated to the church of St. Mark. 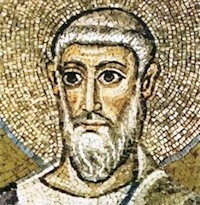 St. Peter Chrysologus' feast is observed on December 4.